I can ask for half a pound of shrimp (or less). The man behind the counter didn't bat an eyelash. That dish looks yummy btw! Thanks! We're all still learning, right? This was my attempt at gumbo for Mardis Gras. The husband loved it; the kids refused to touch it. Looks good! We love gumbo, too. I had red beans and rice with sausage for Fat Tuesday. 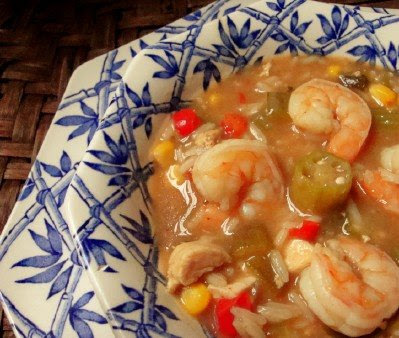 Your gumbo looks very good. I have a cook book written by Justin Wilson that we brought when we vacationed in New Orleans for our 20th wedding anniversary. That looks so good! I miss that our Kroger took out the seafood counter, so you can bet when we go to the gulf in a few months we will be bringing home a cooler full of cheap (local) shrimp! Sometimes I will just ask for a few shrimp - like 10. :) It's best not to waste it, right? It is true that you learn something new every day. That soup looks so yummy... I have to keep reminding myself that I'm fasting today so I shouldn't look at all my blogs! looks so yummy.. Happy Mardi Gras! When Krogers had the shrimp on sale I bought some of the plastic containers with cocktail sauce and froze them . thaw . It was completely full of my " bargains " !!! I did not realize until it was too late, there was a problem. Sometimes trying to save money can cost you money ! Looks delicious! We had pancakes on Tuesday. Second, you are so funny! I hope you now realize you can ask for a half or quarter of anything. I sometimes put Jarlsberg cheese in my mac & cheese. But the pre-packaged kind is so expensive (about 9 dollars a pound!) that I try to just get a quarter pound at the deli counter. And nobody gawks at me, either. I rarely buy shrimp, but when it is on sale for half price I'll sometimes get a bag as a 'treat.' Then I just take out what I need. Shrimp is cool like that...it's like it's individually frozen. I can stretch a bag pretty far. I only wish you could freeze lobster--but it is just awful frozen. I'm glad you enjoyed your Gumbo! Oh my gosh, how true! And how funny! Never say you don't have a sense of humor. Also? That gumbo looks really, really, really good. I want to lick my computer screen. Must be getting close to lunchtime. I hope you post the recipe! Just wait until you ask for 1/8 pound of roast beef, because you are making ONE sandwich for a quick take out lunch, LOL! BTW - we're having gumbo tonight! It's Friday, so it's meatless and will have red beans instead. I attempted my husband's favourite Asian dish last week ~ full of prawns. For five of us at $30/kg it's not a cheap meal to try out. I chose a night when my daughters were out for dinner and saved them a portion to share after school the next day. I only got about 300g instead of 500g. And then I cut them all in half. They spread through the meal further that way. We loved it, but it's on the 'special occasion' list! Lol. I never would have thought of that! Awesome! I learn new things everyday...things my hubby says I should know! We had shrimp stir fry last night (hubby cooked...I am spoiled). We may do it again tonight. It's on sale at Publix!! I've always skimped on shrimp, cuz of the cost. Now my hubs is allergic to it. NO MORE SHRIMP for us! durn it - Since I see bits of chicken, I'll make do with that and some turkey sausage! Looks yummy to me tho'! A few weeks ago I was at our local seafood place and asked the ever-so-adorable "boy" behind the counter if I could just get a quarter pound of the medium, uncooked, tail-on, blah blah blah. I'm the only person who likes shrimp at my house and I didn't want a lot of leftovers. "Ma'am," he said, "I can give you *one* shrimp if that's what you want. Whatever you want, it's all priced by the pound but available any which way." Great! I asked for six shrimp. Too cool, eh?